The National Institute on Drug Abuse (NIDA) Drug Supply Program (DSP) provides a variety of research chemicals, controlled substances, and marijuana cigarettes for research purposes to investigators working in the area of drug abuse, addiction, and related disciplines. Research investigators with primary assignments in academia, public and private research laboratories are encouraged to request these supplies in support of their research. The availability of controlled substances is regulated by the United States Drug Enforcement Administration, Department of Justice under the Control Substances Act, and Psychotropic Convention. These substances include hallucinogens, stimulants, sedatives and hypnotics, narcotics, designer drugs, cannabinoids, marijuana and other miscellaneous category of drugs. More recently, the NIDA DSP has also taken steps to provide a variety of nicotine research cigarettes (NRC) to research investigators. For more information on the Notice of Availability, please see http://grants.nih.gov/grants/guide/notice-files/NOT-DA-14-004.html. aFor more information, about the Investigational Tobacco Product (ITP) application, please refer to the Ordering Guidelines for Nicotine Research Cigarettes. bMembers of the Scientific Committee includes subject matter experts, identified by the NIDA Drug Supply Program. To obtain NRCs from the National Institute on Drug Abuse Drug Supply Program, all research investigators will need to prepare a Request Package. For more information about the Request Package, please see: Ordering Guidelines for Nicotine Research Cigarettes. A Request Package for NRC is submitted to the NIDA Drug Supply Program. Once all request package materials are received, the NIDA Drug Supply Program Director reviews request package for completeness. Materials are reviewed by NIH and assigned to a Program Officer. For non-Grantees, the Program Officer refers to an external Scientific Expert Committee for further review. Once reviewed, the Program Officer provides a recommendation to the NIDA Drug Supply Director for approval. Once approved, if there is adequate inventory of nicotine research cigarettes, the NIDA Drug Supply Director issues shipment authorization. Once all request package materials are received, the NIDA Drug Supply Program Director for consideration. For non-Grantees, the Program Officer refers to FDA and the Scientific Expert Committee for further review. Once approved, and there is adequate inventory of nicotine research cigarettes, the NIDA Drug Supply Director issues shipment authorization. 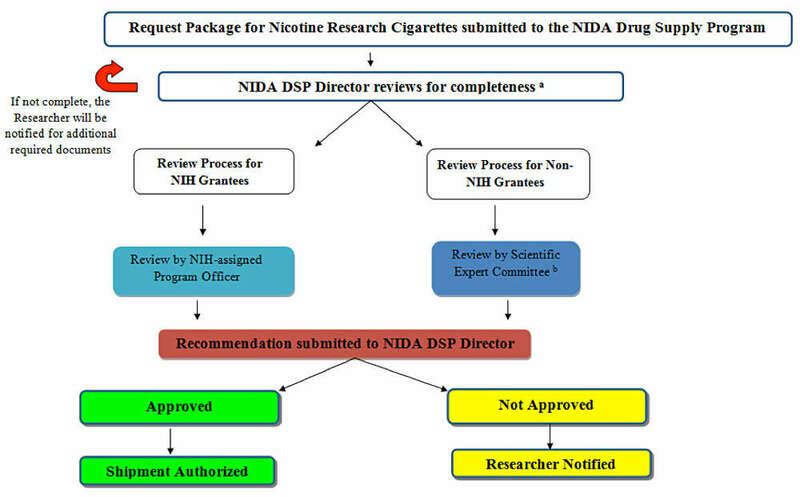 For researchers, in order for the Nicotine Research Cigarette (NRC) order to be deemed complete by the NIDA Drug Supply Program (DSP) Director, an Investigational Tobacco Product (ITP) application needs to be completed and forward to the FDA for approval. Below are helpful notes which will further your application to approval status. Please be consistent and as specific as possible throughout your ITP application. If not, applications may be considered inappropriate and delayed until corrected. Include actual date of previously submitted ITPs for cross-reference. Reference the actual Tobacco Product Master File (TPMF) code name for the requested nicotine research cigarette (NRC) (e.g., NRC 300, RN). As specifically as possible, provide the specific grant number, grant title (where appropriate), project and/or protocol number and title, and PI for the study. Please provide the study sponsor. Note the distinction between “sponsor” and “investigator”: sponsors are typically considered to be the awarded institution (for NIH grants) to which the funding will be designated. Investigators are the primary research contact who conducts the research at that particular institution. Please be sure that the title of SPECTRUM cigarettes should be in all caps and consistent throughout your ITP application.